Shared mobility refers to the behaviour of people sharing various modes of transportation (vehicle, bicycle, scooter or other modes) on an as-needed basis. The goal of shared mobility is to effectively and efficiently use transportation vehicles to help reduce carbon emissions, and congestion while also providing individuals cost-effective ways to get to their destinations. Car sharing: “Individuals gain the benefits of private vehicle use without the costs and responsibilities of ownership” (Shaheen 2015). The individual uses the vehicle when they want and usually pays for only what they use. The company looks after fuel, maintenance and repair tasks and insurance. Station-Based Carsharing (Round Trip): The trip must end in the same place it started. One-Way Carsharing: The vehicle can be picked-up at one station and returned at another. Home Area: A virtual fence where individuals have the freedom to park their vehicle anywhere on permitted side-streets or company-marked parking locations. Free-Floating: Pick up a vehicle and end the trip anywhere in the home area. Carsharing is not a new concept, it started in Switzerland in 1987. Since then it has grown worldwide, with rapid growth in China and the United States. As of July 2015, there are approximately 1.5 million car sharing members using 25,574 shared vehicles in the Americas (Shaheen 2016). The goal of carsharing is to use assets more effectively (i.e. vehicles and land-use). We can see that the goal of carsharing is being achieved: in 2016, each carsharing vehicle replaced 10 personal cars and freed up 9 parking places (6-t Research 2016). The benefits of carsharing is real and now the challenge is to get it widely adopted. There has been many changes since the first car sharing concept launched. Car sharing began with a station-based model that used a paper based system to record trips. People also had to retrieve the keys by either finding it in a hidden hole somewhere behind the license plate or in a lockbox somewhere mounted to a wall close to the parking location of the car. Each member would fill out the trip login a physical ledger which was then collected and invoice on a monthly basis. Changes in travel behaviour due to increase in part-time work with varying schedules, more consumers shopping online and growth in telemedicine. 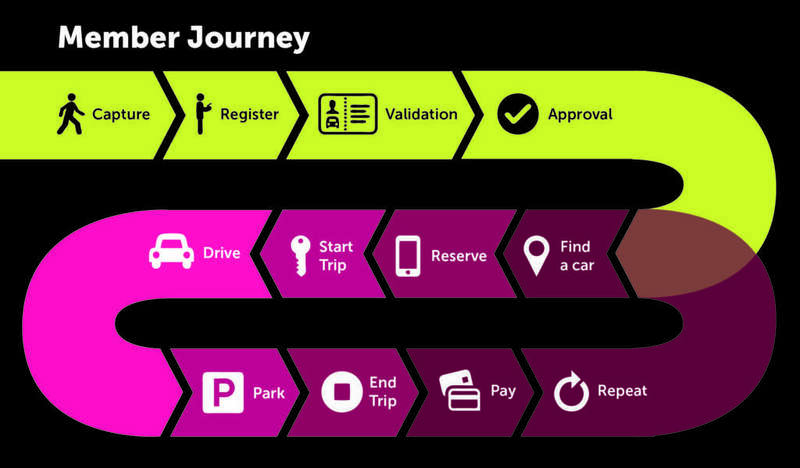 The infographic below highlights the member journey from registration to driving the vehicle to payment. The yellow steps represent the registration process to apply for a car share program. This only needs to be done once. When someone applies to be a member of a carsharing company (such as car2go, BMW ReachNow, or Zipcar), the applicant must fulfill the acceptance criteria, which revolves around a good driving record. Once accepted, the applicant will be a part of the membership pool. The pink steps represent the steps the member must undergo each time they want to use the service. These steps include the member finding and reserving a vehicle via app or website and driving the vehicle without ever needing to go to a rental office. For a more detailed description of the member journey, please see movmi’s blog post here. Free-floating carsharing is the most flexible type of carsharing that is geared towards shorter trips (or as shared mobility experts would say: “solving the first and last mile problem”). Free-floating carsharing is flexible because members can pick up a vehicle and end their trip anywhere in the home area. For round-trips, there is less flexibility and the trips are geared towards longer hourly or multi-day trips. Round-trip carsharing requires the driver to end their trip at the same place the driver picked up the car. The pricing scheme is reflected in the amount of convenience the driver has. Free-floating carsharing pricing offers per minute usage billing, rates range from $0.35 per minute to $0.45 per minute. Round-trip is priced hourly and daily, with hourly rates ranging from $3 to $11 hour of use. That said, free-floating does offer hourly and daily rates as well. In general, free-floating carsharing has a larger fleet size to provide members the ultimate convenience of finding a vehicle within close walking distance at almost any given moment in the Home Area compared to round-trip. However, round-trip carsharing services offer a wider variety of vehicles for users to choose from (e.g. SUVs, minivans, economy cars) whereas a free-floating car share will only offer 1-5 different types of vehicles for members to drive. Long-time players offering roundtrip services include Zipcar, which is a household name in North America, and Communauto, Montreal’s station-based program, is North America’s oldest car share. Mobility is born out of Switzerland and is used by locals. New players that recently emerged include Ekar in Dubai and Maven in U.S. Typically, companies using a round-trip model will charge members a subscription fee to access their vehicles in addition to paying for what you use on an hourly or daily basis. Zipcar recently expanded its model to offer one-way trips as well but only in select cities. Autolib is a 100% electric vehicle fleet that is used by the locals in France. One of the benefits of having a one-way model for electric vehicle is that vehicles are always parked at a charging station and plugged in. car2go was one of the first players to see the potential in free-floating carsharing. The company has exploded in growth: boasting of over 2 million members across North America, Europe and Asia and 14,000 vehicles in 30 locations worldwide. In the past few years, players such as BMW has entered the U.S. and European market with brands such as DriveNow and ReachNow. Geographical expansion beyond large cities. Car sharing primarily services highly populated, dense cities with a more affluent demographic. Operators need to expand their service area outside the city center – especially to prevent membership churn as members move out from the city center to suburban areas. Some cities like Seattle require operators to service in certain areas outside the city center to encourage this behaviour. Providing more social equity by offering options for demographics that cannot drive. Whether it’s a child who is ineligible to drive or a grandpa who can no longer drive, the future of car sharing can embrace more segments of people when autonomous vehicles roll out. In the meantime, car sharing will continue to expand its offering across the world. Business models will become more sophisticated and personalized to its members so they receive the utmost convenience for their commutes while making it as pleasurable as possible. 6-t Research. National Survey on Carsharing. 2016. 6-t Research. Shaheen, A. Cohen, & I. Zohdy. Shared Mobility: Current Practices and Guiding Principles. U.S. Department of Transportation Federal Highway Administration. Peer-to-Peer (P2P) Carsharing: car owners rent out their vehicles temporarily by posting ads through an online platform. The online platform will take a percentage of commission for connecting the drivers with the car owners and to cover costs such as insurance. Peer-to-peer carsharing (P2P) is often described as “AirBnb for your car”. It capitalizes on the fact that cars sit idle 22 hours a day and has found a way to increase the utilization rate so that it benefits the car owner and the driver. P2P has gained popularity in North America and Europe with many newcomers popping up in the industry. It is estimated that the peer-to-peer carsharing model has an average of 2 to 3 rentals per day (Frost & Suillivan). Peer-to-peer car sharing is a relatively new model that is beginning to popularize in North America and Europe with the help of technology allowing members to make reservations and lock/unlock vehicles at the touch of their fingertips and the increasingly acceptance of the sharing economy. Another key factor to increasing popularity is the ability to read reviews about the car owner and renter to establish trust in the service. P2P gives car owners the benefit of earning revenue on their vehicle when it would have otherwise sat idle. This helps them reduce their cost of car ownership. Renters can also benefit with lower prices because they do not have to pay for overhead costs typically incurred with car rental agencies (office space, employees, etc.). The car owner applies to be on a platform such as Turo and Getaround and, once approved, post an advertisement of when people can rent their car. The car owner or company will set a price for how much the renter needs to pay with prices advertised usually by hour or by day. People who want to rent the vehicle need to apply as well and be approved into the membership base (their driving record is check). A member will make a request to the car owner where the car owner can accept or decline the request. Depending on the company, physical keys may be handed off between owner and renter or renters receive a special “technology key” to unlock the vehicle for the reservation time period (usually done via app). Turo is an American-based company that offers drivers over 800 different makes and models on its platform. Turo has presence more than 4,500 cities and 300 airports across the U.S., Canada, and U.K. Turo is a technology-light solution where car owners post an ad to rent their vehicle and interested rents make a reservation request. If accepted, the car owner and renter meet in person to exchange keys. Getaround also offers P2P services in the U.S., Canada and U.K – but offered in fewer cities compared to Turo. Getaround eliminates the need for physical key exchange by allowing renters to unlock the vehicle with a special electronic key via app.That said, car owners must pay $20 monthly subscription fee for the telematics box. Getaround recently teamed up with Uber that allows non car owners to drive other people for extra cash (Turo). Other players in the market include carzapp, Koolicar, GoMore, Drivy, tamyca and Sharoo. Peer-to-peer carsharing is still a relatively new concept. Although the widening acceptance of shared economy and smartphone technology enables the P2P car sharing industry to grow, there are still barriers. Since it is new to the market, many U.S. and Canadian personal auto insurers do not allow for commercial use. As well, with rising insurance costs this passes down onto drivers. Perhaps as more people become aware of P2P and use the service this will create more actuarial data which will, in turn, make insurance companies more comfortable to offer these products. Image taken from “Cost and Other Benefits Drive Peer-to-Peer Carsharing Adoption in Europe and North America.” 2015. 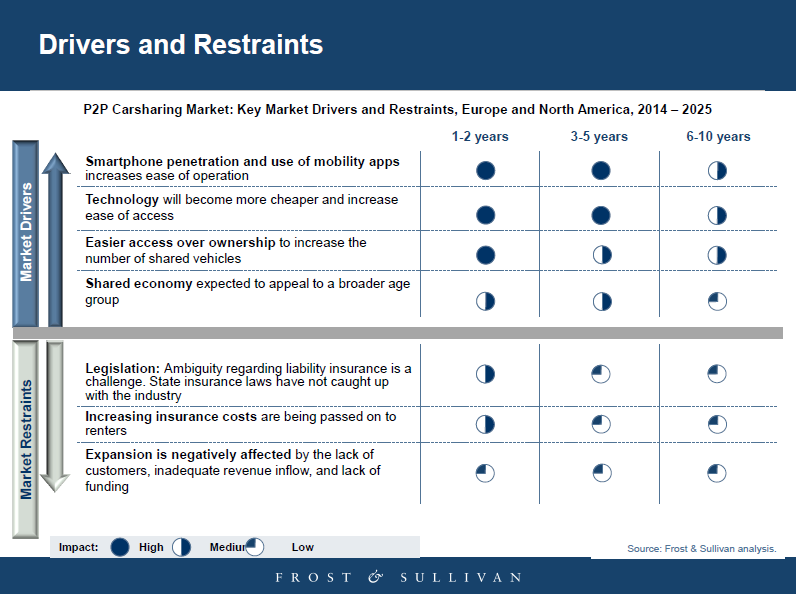 Frost & Sullivan. Dockless bike sharing: On demand service, where the member picks up the vehicle and can leave the bike anywhere. Electric Bike sharing: Bicycle that have an electric motor that reduces the amount of effort the rider needs to give. These bikes can be ideal for cities with hills. Similar to other shared mobility programs, technology allowed bike sharing programs to evolve so that people could easily reserve a bike and easily find a place to drop it off. The first modern bike sharing system launched in the United States was in 2010. As seen in the graphic below, there was 28 million trips taken in the United States in 2016, a 25% increase from the year before (NACTO 2016). According to NACTO, the “number of bike share systems…has steadily increased year-over-year, from four systems in 2010 to 55 systems in 2016” (NACTO 2016). Not only have the number of systems increased but the types of systems are starting to change too from station based to dockless. 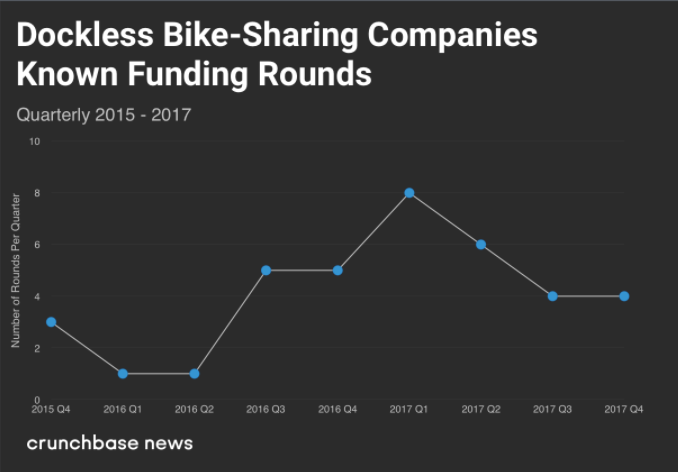 Over the course of one year, from 2016 to 2017, investment funding for dockless bike share programs grew from $174 million to $735 million. People apply to be a part of a bike sharing program, applying to certain programs that may be on a per minute, daily, monthly or annual basis. Depending on the membership type, the price per minute will vary. The average daily pass cost $7.77, $28.09 per month for monthly memberships and $62.46 per year for annual memberships according to a 2012 survey of 20 U.S. public bike sharing programs (Shaheen S., Martin, Chan, Cohen & Pogodzinsiki). Some states offer subsidies based on income (see figure below). Once approved into the program, the member searches for a bicycle via smartphone app to see the nearest one. The member can place a hold (reserve) the bicycle and unlock it with a unique specific PIN via smartphone. The member takes the bicycle and either locks it back into a docking station or elsewhere (depending on operators rules). Hangzhou, China has by far the largest bike share system in the world, tallying somewhere between 66,500 and 78,000 bicycles across 2700 stations ((listofbiggestbikeshare). Shanghai and Taiyuan China are two cities with large bike share programs as well. To put in perspective how large China’s bike sharing industry is, there were more bike-sharing rides in China in the first quarter of 2017 than all bike-sharing rides combined in all of North America. Mobike and Ofo are the two major players in China’s market with sights on expanding to the United States and Europe. Velib is a bike share company focusing in Paris, France with approximately 20,000 bikes and over 1200 stations in their fleet. Motivate is the dominant player in the U.S. market with 63% market share. That said, the market is becoming fiercely competitive with new entrants such as LimeBike and Spin. The bike sharing industry will continue to grow. Other shared mobility players are looking into the space, such as DiDi (China’s largest ride-hailing company) announced plans to offer bike sharing (CNBC). With the significant growth in investment funds, this further indicates the industry will grow; however, it remains to be seen if dockless bikes will be a feasible business model due to the operational challenges and theft. Crunchbase. Regulation Looms in Booming, Competitive Bike-sharing Space. 2018. Kharpal, A. Chinese Uber rival Didi Chuxing launches bike-sharing service. 2018. Icebike. The World’s Surprising Top 8 Bike Share Programs. 2018. National Association of City Transportation Officials. Bike Share in the US: 2010-2016. Ride Sharing/ Carpooling: The driver picks up passengers en route to similar destinations. Ride sharing and carpooling is not intended for profit – but rather to offset costs such as fuel and maintenance costs. Carpooling can be used for short or long distance trips. One contributing factor for traffic congestion is because many cars only contain one passenger. In Canada, 83% drove alone compared to only 17% who commuted to work by car, truck or van (Canada Census). Carpooling helps increase the number of passengers per vehicle which helps takes vehicles off the road (and also reduces carbon emissions). It is estimated that if everyone carpooled once a week that traffic would be reduced by 20% (Statistic Brain). According to Shaheen, Cohen and Zohdy’s Shared Mobility Primer (Shaheen, Coehn & Zohdy), there is approximately 638 ridematching services in North America, offline and online. Of the total, only 24 programs span both countries. The United States held 401 of the total ridematching services and Canada had 261. The idea of carpooling came to the United States in the 1940s as a rationing tactic (Ridesharechoices). Companies such as 3M and Chrysler were the forerunners to provide incentives to its employees to use carpooling, of which, other companies still do today. Carpooling has struggled to gain mass adoption for commuting routes for a variety of reasons, some of which include: personal safety concerns, lack of flexibility or control and effort required to organize a carpool (Transport Canada). Blablacar is the world’s leading long distance carpooling services that connects drivers with empty seats to people traveling the same way. The company focuses on building a social community that builds bonds so that the trip is more than just getting from point A to point B. To date, Blablacar is worth approximately $1.5 billion (Techcrunch), providing services primarily in Western Europe but expanding into Russia, Eastern Europe and Brazil. They are also currently testing short-trip commutes with BlaBlaLines. Poparide is a carpooling marketplace for long-distance trips that primarily plans trips for the Canadian market and some major United State routes. This Vancouver-based startup has helped drivers and passengers share over 10 million kilometres since 2014. For shorter commutes, Scoop helps people with their weekday commutes by pairing up trips the night before with drivers and passengers. It uses an algorithm to figure out the best matches and routes. GoKid goes after a niche market by helping busy parents coordinate rides for their children. To make the experience even better for all drivers and passengers, GoKid works with schools to match children with their peers so matches can be made by distance, grade and interest. Carpooling for commuter routes is unlikely to gain significant traction in certain states and provinces in Canada and United States. It’s hard to meet the delicate balance of supply and demand (i.e. having enough drivers and passengers) and carpool users have to overcome other challenges such as finding convenient pickup and drop off points with large city dispersity. There’s also a trust factor and the variability in driver/passenger experience – everyone has their own preferences on the ideal commute (silence or conversation, etc.) If carpooling is to be successful in these markets, these barriers will need to be overcome. That said, route planning to bring drivers and commuters together is becoming more sophisticated with the help of algorithms. Algorithms yields to optimized route planning that improves the drivers and passengers experience. Longer distance commutes pose a better outlook as these are routes are infrequent to the user and more tolerance is usually accepted for the discussed barriers. WIth the help of this technology, companies such as Moia by Volkswagen, Chariot by Ford and Wunder are using this to provide carpooling services – but in a professional way. Instead of a private person sharing the ride with his/her neighbours, Moia, Chariot and Wunder supply minivans with professional drivers that will pick up 6-12 people to their destinations. This growing service is referred to as microtransit (aka Demand Responsive Transit Systems), which can be found under Shared Mobility & Technologies section. Transport Canada. Carpooling trends in Canada and abroad.2008. Commuting to work. Statistics Canada. 2011. Oliphant, M. & Amey, A. Dynamic Ridesharing: Carpooling Meets the Information Age. 2010. Shaheen, S., Cohen, A. & Zohdy, I. Shared Mobility: Current Practices and Guiding Principles. Ride hailing: On-demand service where someone picks you up and drives you to desired location. Transportation Network Companies: uses an online platform that connects passengers with drivers. This allowed new entrants such as Uber and Lyft to disrupt the market by limitlessly adding available cars to hail, seamless payment integration and transparency with route-driving and two-way feedback review loops to ensure the driver and member have a good experience. DiDi Chuxing is China’s largest ride-hailing operator and is trying to achieve global dominance. DiDi has expanded rapidly into Europe and Africa by partnering with Taxify. In 2018, they bought controlling stake in the company 99, which is Brazil’s largest startup rideshare company (https://www.theverge.com/2018/1/3/16846118/didi-chuxing-99-brazil-acquire-ride-share). Late in 2017, DiDi raised $4 billion to accelerate its’ global expansion by focusing on AI and smart transportation solutions and by continuing to diversify international operations and partnerships. Lyft is Uber’s rival in the U.S. market. Currently Lyft operates in 300 cities and is looking to expand into Canada as of December 2017. Lyft has formed a strategic alliance with three other ride-hailing companies (DiDi, GrabTaxi, and Ola) to gain worldwide presence in Southeast Asia, India, China and the U.S. This strategic alliance allows them to reach 50% of the world’s population. The ride-hailing is expected to grow significantly. Goldman Sachs predicts that by 2030, the ride-hailing industry will be worth $285 billion (Marketwatch). It is unclear who the market leader will be in the long-run and if there will be room for smaller players to compete in local markets. As TNC’s such as Uber and DiDi continue to gain dominance in the ride-hailing market, this also threatens the taxi industry as a whole. Marketwatch. Ride-hailing industry expected to grow eightfold to $285 billion by 2030. 2017. While car sharing, ride-hailing, bike sharing and even most carpooling rides, give more flexibility and convenience for commuting, the problem with these shared mobility types is that they do not transport many people per vehicle. Microtransit (aka Demand Responsive Transit Systems) tries to solve this problem by using dynamic shuttles that take 6-8 people per vehicle. Customers can pre-book their seat using an app or website and get dropped off nearby to their desired end location. Microtransit can be setup in a variety of ways depending on certain factors such as: route type (fixed or flexible), how heavily its integration with other transportation options and type of driver (employed, crowdsourced or autonomous vehicle). Bridj is a public transport service that uses a demand responsive transit platform which currently operates in Brisbane, Australia and Boston, Massachusetts. It uses a data-centric approach that anticipates where and how passengers want to move by offering pop-up bus services according to the needs of the city. It uses real-time traffic data and passenger inputs to get passengers from point A to point B the fastest – it will dynamically change the route on-the-fly to do so. Other examples of microtransit operators include Ford Chariot, Moia by Volkswagen, moovel by Daimler and Wunder. Mobility as a Service (MaaS) is a concept that enables users to plan their transportation routes using various modes of transportation in a seamless, frictionless way. To achieve MaaS this requires the collaboration and cooperation of various stakeholders: from public transportation providers to private operators in the carsharing, ride hailing, and bike sharing fields. While MaaS is more than just an app, users will use “aggregator apps” that specialize in integrating various mobility service providers (such as car2go and Uber) onto one screen interface. This allows users to know where the nearest car share or ride hail vehicle is among multiple providers and can also help with complex route planning to know what’s the quickest or cheapest way to get to their destination, using various modes of transportation. Currently on the market, moovel allows users to plan trips using buses, trains, carsharing, and taxis. Urbi users can use their app to use car sharing, scooter sharing or ride sharing services. Free2Move aggregates car sharing companies such as car2go and BMW ReachNow. Whim, which services all of Finland, integrates a variety of transportation modes including: public transportation, taxis and car sharing. With Whim, users receive discounts on transportation modes if they opt in the subscription which can be highly cost effective for frequent commuters. Users can also use the pay as you go method and use Whim for route planning services. Whim is a service of MaaS Global that embodies a user-centric approach to drive the company. This approach paid off as Whim won the top award for Best Mobile Service in Finland for its user-friendly design, useful features and high quality service development (MaaS Global). There are more shared mobility options at people’s fingertips than ever before. With blockchain technology, machine-learning, and autonomous vehicles starting to hit the roads, the industry is going through more rapid changes than in the last 100 years. For many people, their daily commuting routine is going to change dramatically. That said, there are many cities and areas that cannot provide these services due to geographical layout, density, income and other factors. Some types of shared mobility such as car sharing and ride hailing are usually geared towards people with higher disposable incomes and are fully mobile – meaning that others will less disposable income and need additional mobility assistance are unintentionally excluded. Around the world though, public transit and shared mobility providers are joining forces to make mobility services more inclusive. This type of partnership provides good balance because privately run shared mobility companies such as car2go and Uber push the envelope of transportation where public transit ensures the mandate of providing inclusive transportation and options to everyone is upheld. With pressing issues such as congestion, carbon emissions, and rising populations it is imperative that these two parties work together to create the next generation of transportation so cities are livable around the world. Interested in learning more about shared mobility in your city, or a specific location of interest. Contact us here for our Shared Mobility City Index (SMCI).